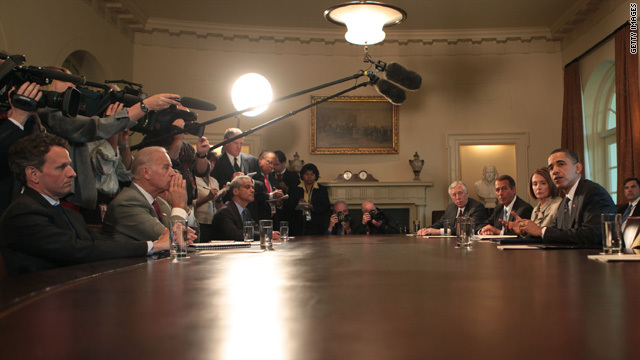 President Obama meets with Congressional leadership in the Cabinet Room of the White House on April 14. Editor's note: Julian E. Zelizer is a professor of history and public affairs at Princeton University. He is the author of "Arsenal of Democracy: The Politics of National Security: From World War II to the War on Terrorism," and of a book on former President Jimmy Carter, to be published next fall by Times Books. Princeton, New Jersey (CNN) -- Congressional Democrats have been warning President Obama to tone down his anti-Washington rhetoric. While the president has continued to expound on his campaign themes about the need to change the way Washington works, many of his colleagues on Capitol Hill have been uncomfortable with this posture. Speaker Pelosi and others have asked him to focus his fire on Republicans rather than the system of which they are a part. The dangers that President Obama, whose 2008 slogan was "change we can believe in," faces from continuing to depict himself as an agent of change became clearer over the past few weeks. Two stories have recently emerged that raise more questions about his reform credentials. The first damaging story is that White House officials had informed Rep. Joe Sestak of an unpaid job with the hope that he would get out of the race against Sen. Arlen Specter. The more recent story involves evidence that the White House deputy chief of staff dangled before Andrew Romanoff a choice of three positions with the hope that he too would get out of a Democratic primary, this one in Colorado. Romanoff is challenging Sen. Michael Bennet, who the administration supports. These stories come after other developments have already weakened President Obama's standing as a reformer. The administration has abandoned many of its proposals to reform the political process. Obama has also engaged in the kind of wheeling and dealing to pass health care reform that many Americans who supported him find abhorrent. President Obama is facing a problem common to most candidates who run on the theme of change. Once they are in power, they have to work within the system they once lambasted if they want to get anything done. President Jimmy Carter faced a similar problem in 1977. He too ran on a campaign stressing change. "I'll never lie to you," he said to his supporters. Carter told voters they could trust him and he would change the system that brought the nation Watergate. Carter attacked the interest groups that dominated Washington, including those that supported Democrats such as organized labor. From the start, congressional Democrats were uncomfortable with what they heard. Speaker Tip O'Neill complained that Carter rode into Washington like a "knight on a white horse." This all made the Bert Lance scandal doubly painful for the administration in the summer of 1977. Bert Lance was a longtime advisor to Carter and the former president of the Calhoun First National Bank of Georgia. Carter had appointed Lance as the director of the Office of Management and Budget. Lance became the focus of a controversy in the summer of 1977. He had promised to sell his stocks during the Senate confirmation hearings, but changed his mind when he realized the kinds of losses that would be incurred. When the Senate considered whether putting the money into a blind trust was a viable option, questions emerged about his financial background, including questionable loans he had received. The president stood by Lance throughout the inquiry. The investigations did not turn up anything illegal but they did find many stories that had a troubling appearance. By the end of the summer the media was consumed with "Lance-gate." In the middle of September more damaging accusations emerged about members of his wife's family having written bad checks and his having used corporate airplanes. Lance resigned. Although the story about the scandal was far more dramatic than Lance's actual behavior, the damage was nonetheless significant. Carter's approval ratings started to plummet after he had enjoyed a successful first year. He was never able to recapture the moral high ground he had claimed with the election. His opponents within the Democratic and Republican parties were more confident attacking the president than in previous months. In some ways, the kinds of problems that Obama is confronting as a result of these job offers were inevitable. Despite claims by some critics that laws were broken, thus far there is no evidence that the Sestak or Romanoff scandals amount to anything more than politics as usual in Washington, the kind of activity that has occurred under Democratic and Republican administrations. But, as Carter discovered with Lance, such stories can be damaging. In addition to shaking Obama's narrative about being a reformer who is not part of the system, they convey a sense of political weakness. The administration has had trouble influencing special elections and these examples suggest it is becoming desperate for a victory. As one political strategist told The Washington Post, "They've tried to influence these races and nobody's listening . . . A sitting president who arguably still had some political capital to spend was not able to prevent some pretty divisive primaries." Assuming Obama can survive the frenzy without damage, these episodes might convince Obama to listen more carefully to his Democratic colleagues, railing less against the Washington in which he now governs and focusing more on his policy agenda and the differences that he sees with the GOP. The rhetoric against politics as usual becomes increasingly stale from a politician who is as deeply immersed in the system as anyone else. The opinions expressed in this commentary are solely those of Julian E. Zelizer.